Fairies, hobbits, superheroes, villains, queens, princesses and the like all need a cape to complete the outfit. Lucky for you that a cape is easy to make. 1-2 yards of fabric (depending on how long you'd like it), any color of your choice. Bolts of fabric have different widths, though, so the wider your bolt of fabric, the more flow the cape will have. I advise visiting Amazon.com, where they now cut and deliver fabric right to your door. A sewing machine or sewing kit. Once you have all your materials, we can get started. 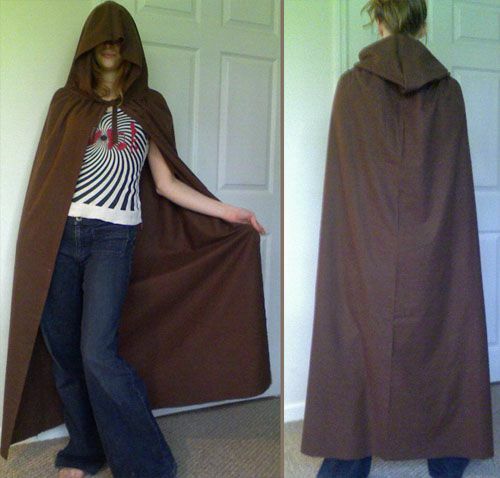 If you want an extra-droopy hood and larger cape, measure the hood as 35" x 20" instead. Next, measure the length of the cape. Use your measuring tape to measure from your shoulder to your calf, or wherever you want your cape to end. An easier way to measure your cape length is to lay down on the fabric. 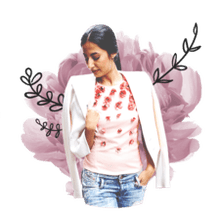 Lay with the top edge of the fabric at your shoulders. Sit up without moving your legs. Mark with chalk at your leg where you want the cape to fall. Make another mark a few inches lower. This is where you will cut. Use your measuring tape to mark this line all the way across the fabric. Cut across. You can hem all around the edges of your cape if you are going for a refined look. For a rougher look, leave the edges raw. Over time, the edges will unravel. Alternately, you can blanket stitch to add a decorative look to the edges. Cut out your hood and cape pieces. Save the scrap fabric to make the cape ties. Next, we will hem the hood. Fold in the short edges of the hood about a 1/2". Pin and then iron in place. You don't have to iron these, but it will make sewing easier. Stitch the hem and set the hood aside for now. Next, we will gather the cape. Loosely straight stitch along the edge of the cape, a 1/4" from the edge. We are putting a loose thread along the edge of the cape so that we can use it to evenly gather the cape. This is called 'basting'. If you are using a sewing machine, set it for the longest stitch available. Leave plenty of loose thread on the edge. After you have threaded the edge of the cape, hold the extra thread with one hand and use the other to scrunch the fabric down along the thread. Continue to evenly gather the fabric along the thread until the edge of the cape is the same length as the hood. Next, we will sew the hood to the cape. Lay the hood on the gathered end of the cape. The hood should be upside-down so that the hemmed edges are on top. The cape should be right-side up. Sew the cape to the hood. Fold the hood as shown in the photo, touching the top two corners together. Make sure you are touching together the right sides of the fabric so the hood is inside-out. Straight stitch along the new fold you just made. Now your cape is assembled and you just need to make the ties for the neck. Cut two rectangles from the spare fabric, 10" x 3". Fold the two long edges of the rectangles to the center. Now fold the rectangles in half. Straight stitch along the open edge of the rectangle. Next, you will finish up by stitching the ties to the cape. You can add applique patches such as suns, fairies, and moons to personalize your cape. For a rough look, cut jagged edges on the bottom of your cape. In the case of a princess cape, you can add eyelet or ruffles to the edges.